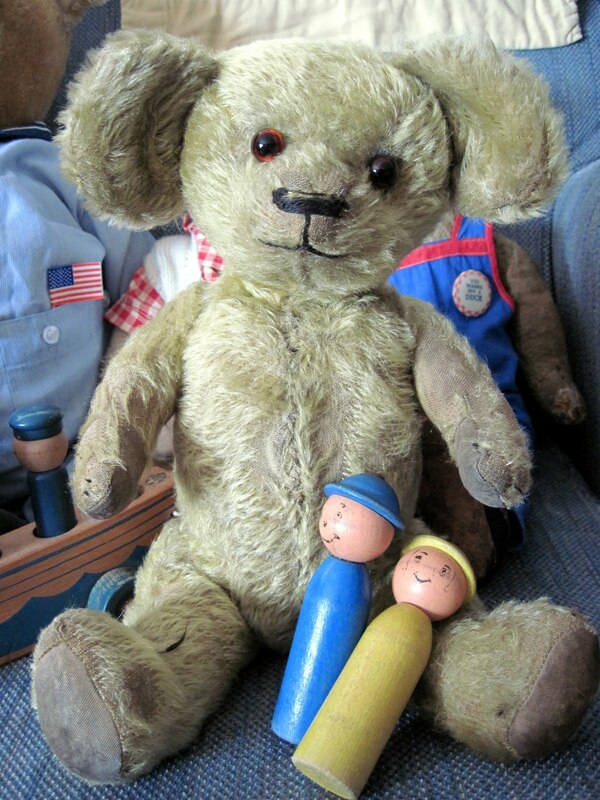 A while back, I posted an entry about an antique teddy bear that I had tentatively identified as American, from the early 1920s. 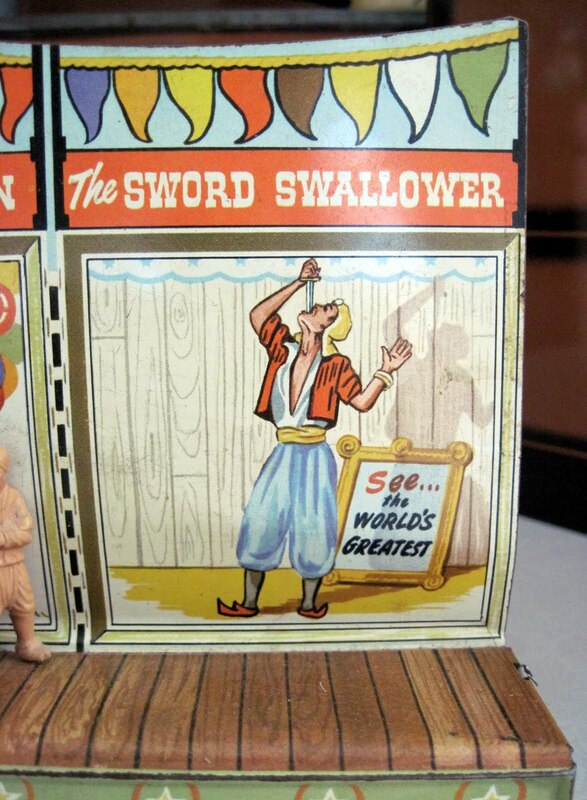 Well, was I ever wrong! 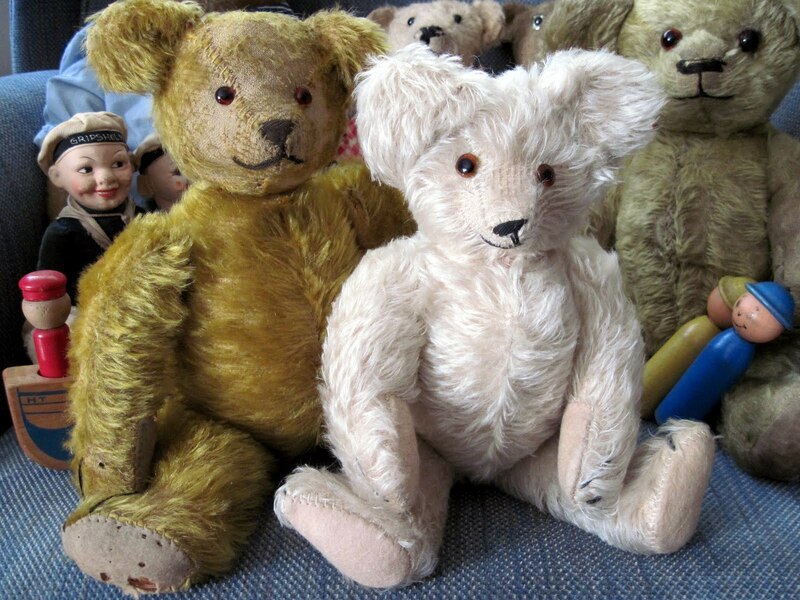 But I wouldn't have known without a recent teddy bear purchase and a tip from its helpful eBay seller. Here are the two bears in question, side by side. 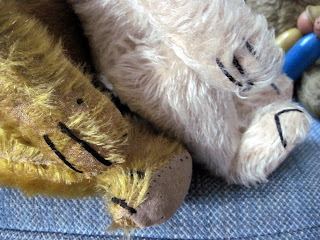 The gold bear is the first one, which we guessed was American based on the inset cloth nose and happy expression. But it remained a puzzling bruin, with a very odd body structure, and I remained rather uncertain about it. A couple of weeks ago, I found the second bear, the white one on the right, and after studying it, realized they're both by the same maker. 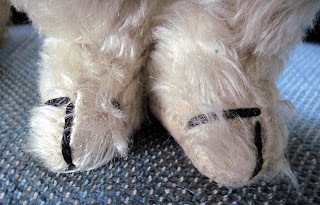 The wear present on the first bear makes them not as obviously identical as one might hope, but the type of eyes, size and placement of ears (which contain tiny squeakers! ), inset cloth nose, crooked grins, tubby body shape, and the unusual limbs all match. 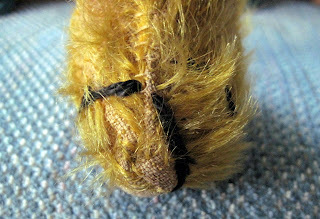 What really clinched the ID was the claw stitching, some of the most unusual I've ever seen. The feet feature odd, linked up stitches, while the paws have very long, thick claws. 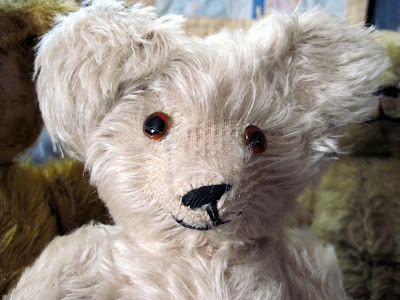 The seller of the white bear suggested the British maker, Peacock, as the source, with a date of 1914, and using that information I finally found a reference to this bear in a guide book. Turns out it's a pretty rare bear, so I feel doubly lucky to now have two! 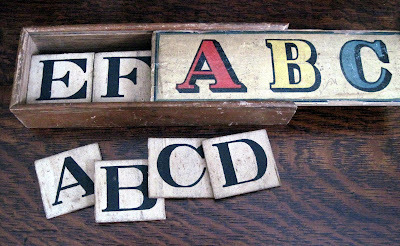 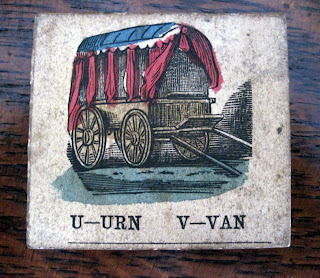 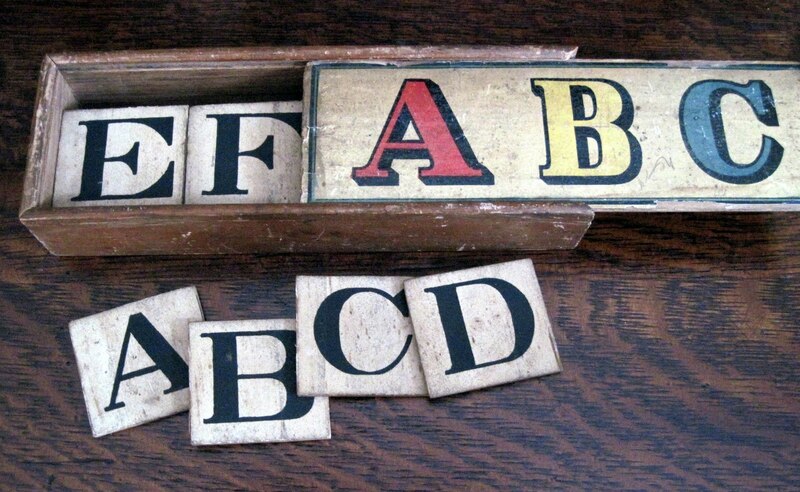 Found at an antique store last weekend was this great set of Victorian alphabet tiles, in their original box with sliding cover. 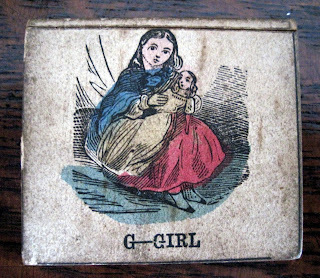 The wooden box is 9 inches long, and each lithographed tile is 2 1/4 inches wide by 1/8 of an inch thick. "G" is for "girl", with a dolly, of course! it's actually, and unusually, an adjective! 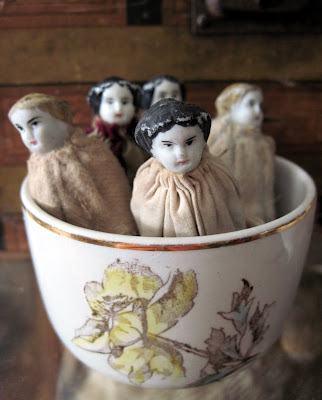 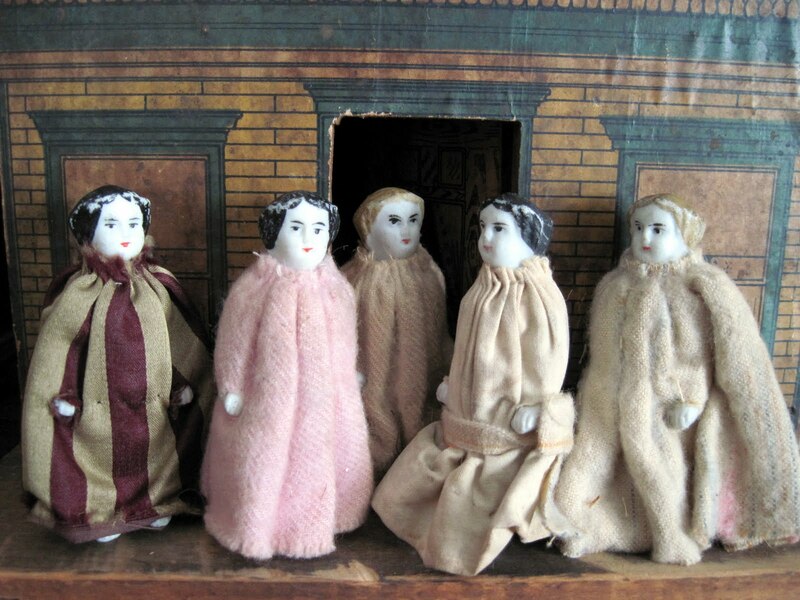 Yesterday I found this set of five little late 1800s Frozen Charlotte dolls at an antique store. They're wearing very old dresses, handmade by a young owner long ago. 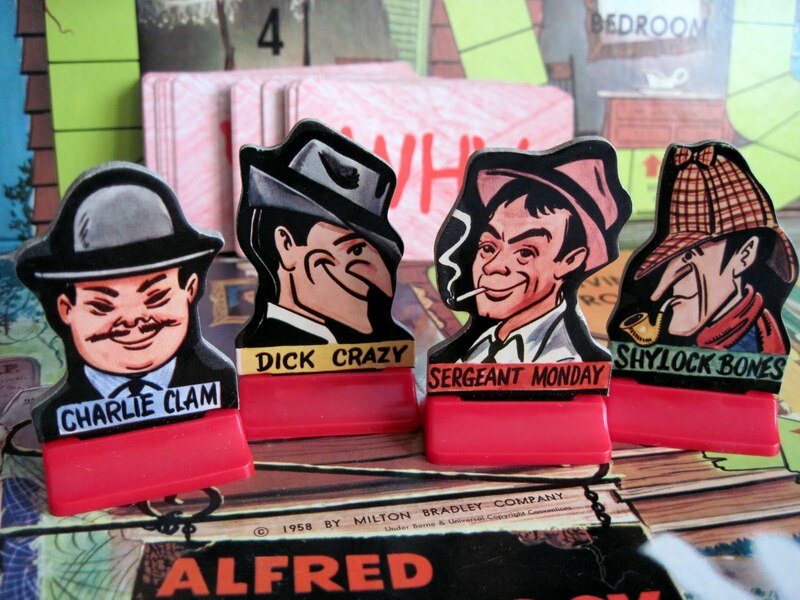 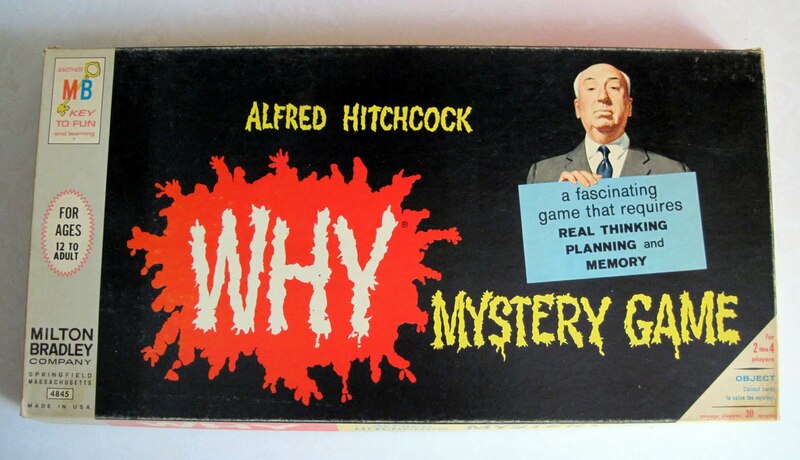 1) Why: the Alfred Hitchcock Mystery Game from 1958: complete and in fantastic condition. Price: .75 cents!!! 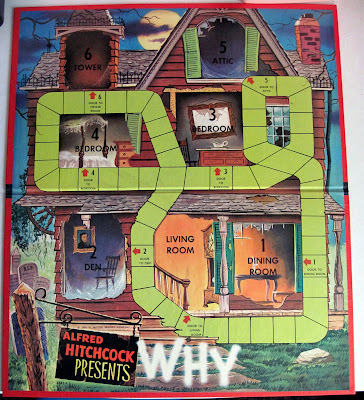 This is a much-sought vintage game that typically sells in the $45-$65 range, with appeal for TV, movie, horror, toy, and board game collectors. 2) a 1963 Barbie Fashion Queen doll, with two of her three original wigs, also in great condition. 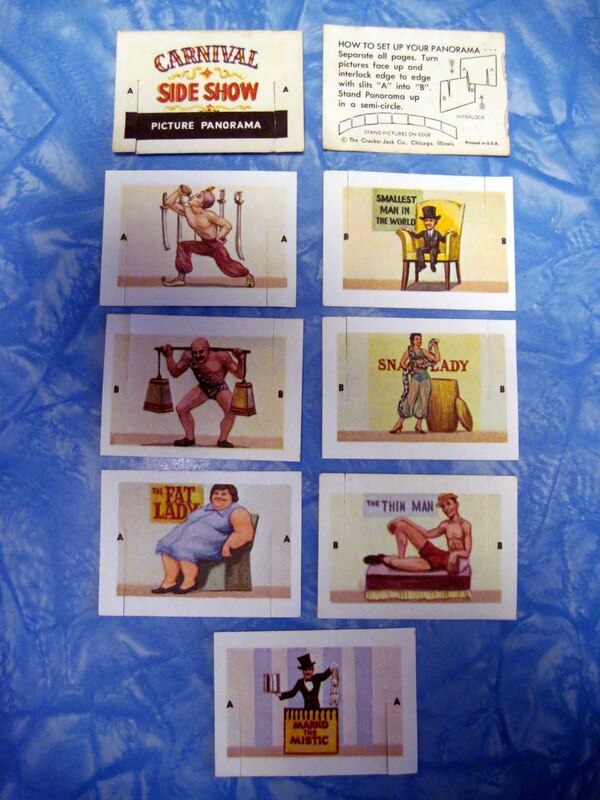 Price: $5.00!!! 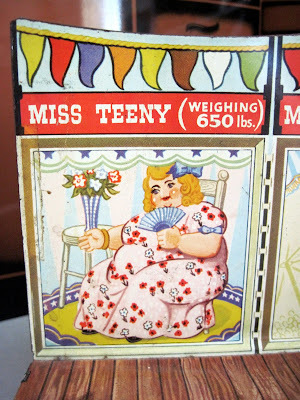 This Fashion Queen would normally retail for about $50-70. Alfred Hitchcock's Mystery Game, Why, is basically a paranormal version of Clue, the classic detective game. 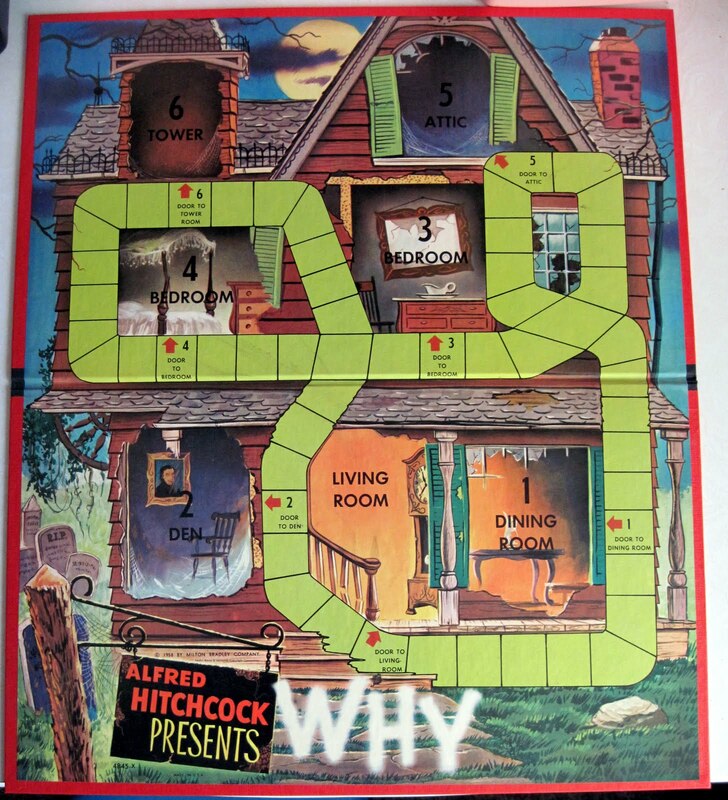 The premise is that Alfred's mansion, depicted on the wonderfully illustrated game board, is haunted by several ghosts, and he's hired four famous detectives, one of whom is played by you, to determine how and why the ghosts were murdered. 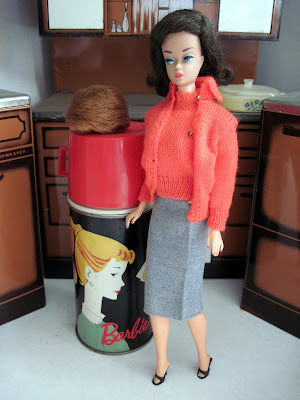 The Fashion Queen Barbie was an unusual entry in the legendary doll line. 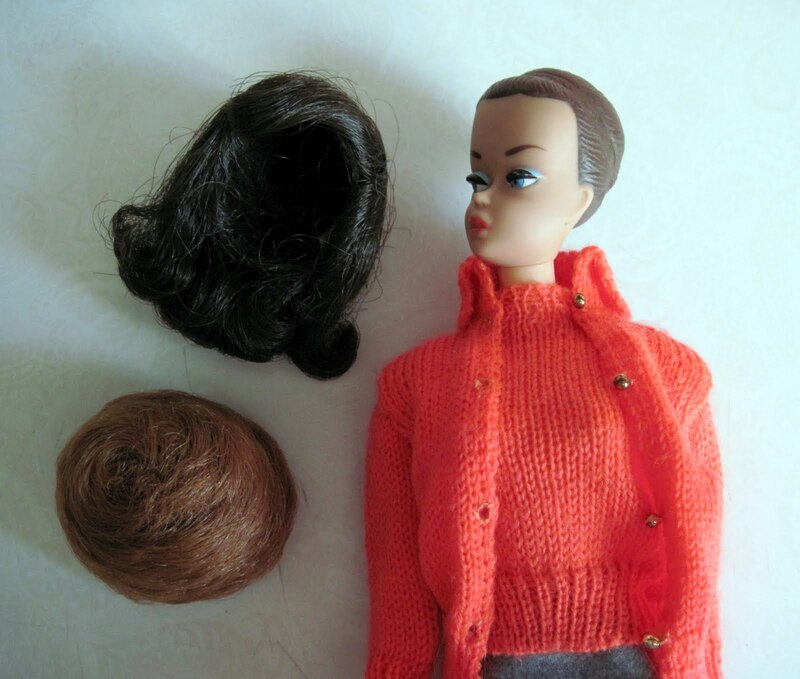 Instead of rooted hair, she featured a molded 'do, and came with three wigs in differing colors and styles so her young owner could change her looks. 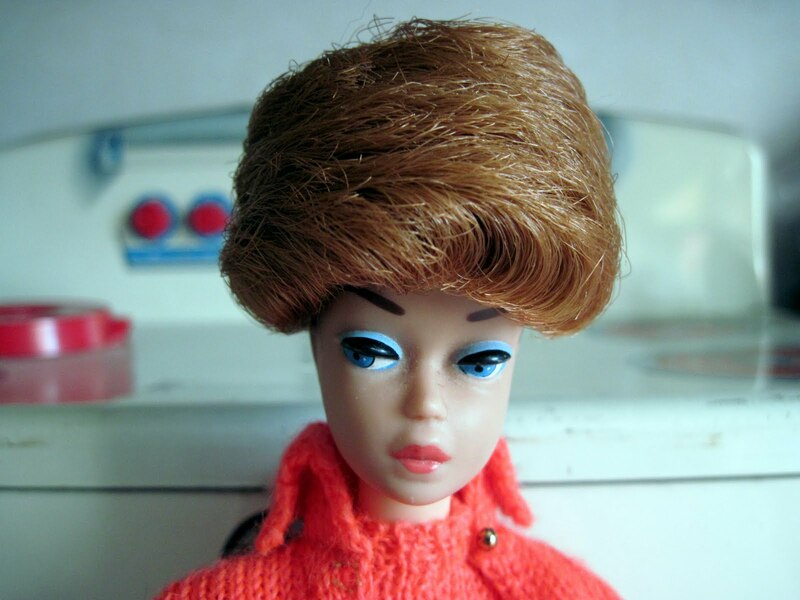 Unfortunately, the materials in the wigs and head reacted badly to each other over time, resulting in chemical melt marks to the doll's cranium if the wigs were left in place for an extended period. This makes finding a Fashion Queen in good condition a bit trickier than one might expect. 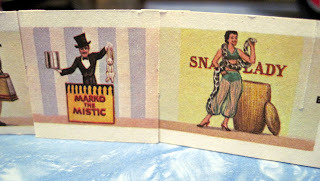 My rummage sale find is amazingly and delightfully melt mark free. I found this doll glider at an outdoor antique show last weekend, and couldn't wait to get it home and load it up with dolls and bears. 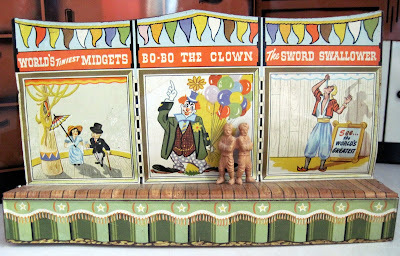 It measures about 14 inches tall, and was probably made in the 1950s. 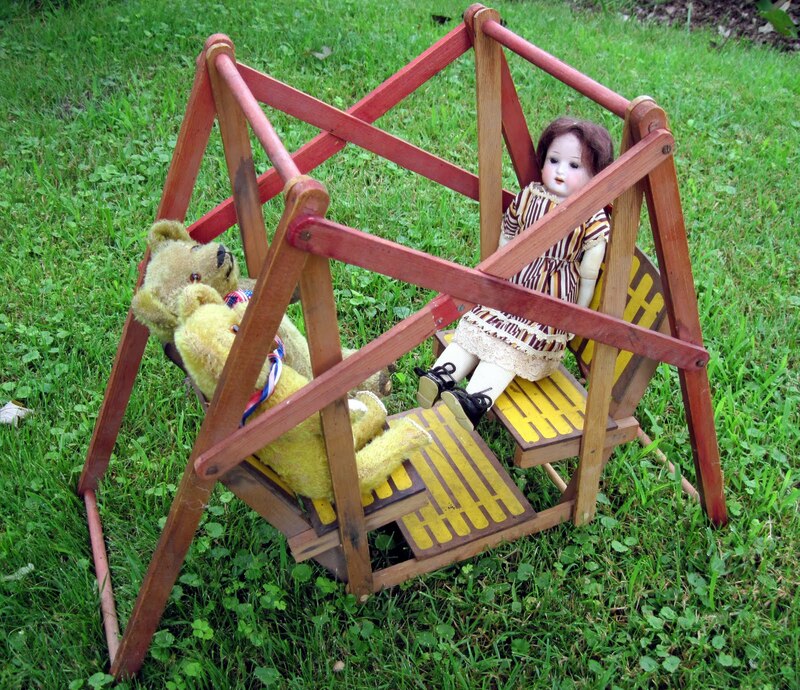 Below, a 1900s German bisque doll and two 1920s American teddies enjoy a swing on the lawn. 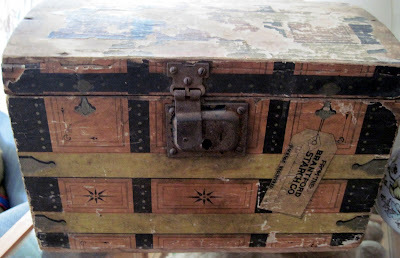 I found this small lithographed wooden doll trunk at an antique show last weekend, and even though it's in rather rough condition, it still charmed me. 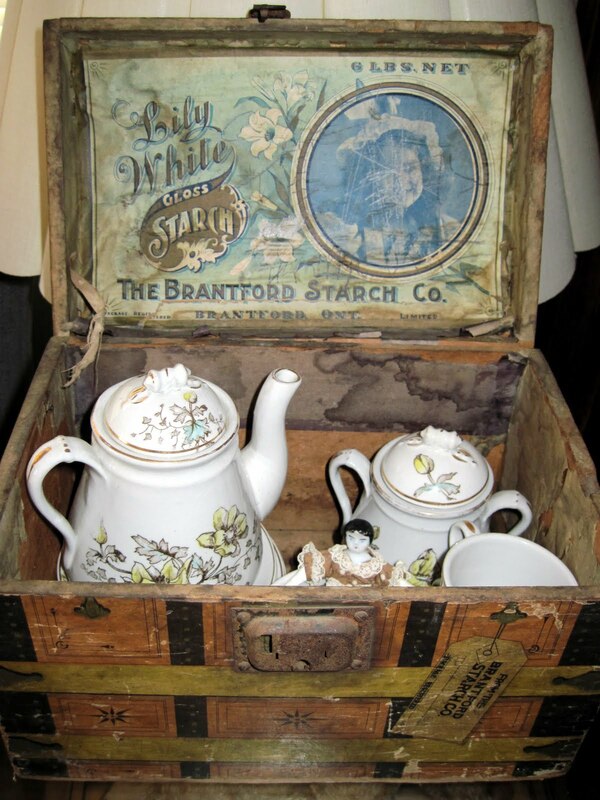 It's an appealing size, measuring only about 10 inches wide, and appears to have been an advertising premium from the Brantford Starch Company of Brantford, Ontario, Canada. 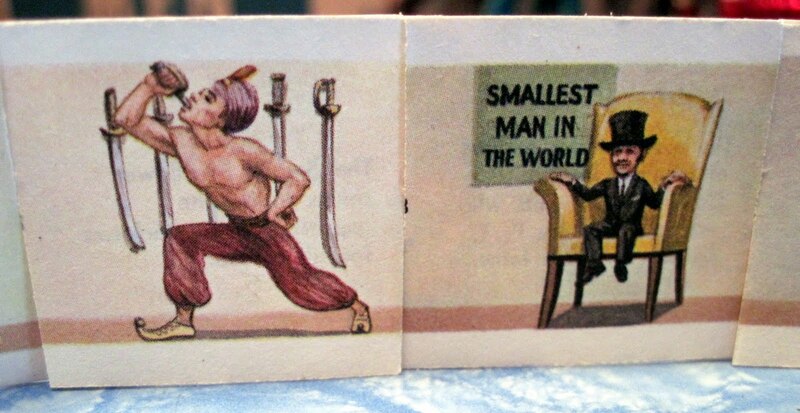 and a tiny china doll. 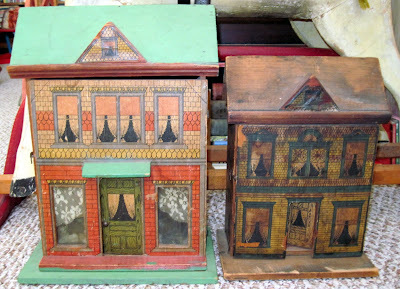 Recently, I posted about my first antique American lithographed wooden dollhouse. 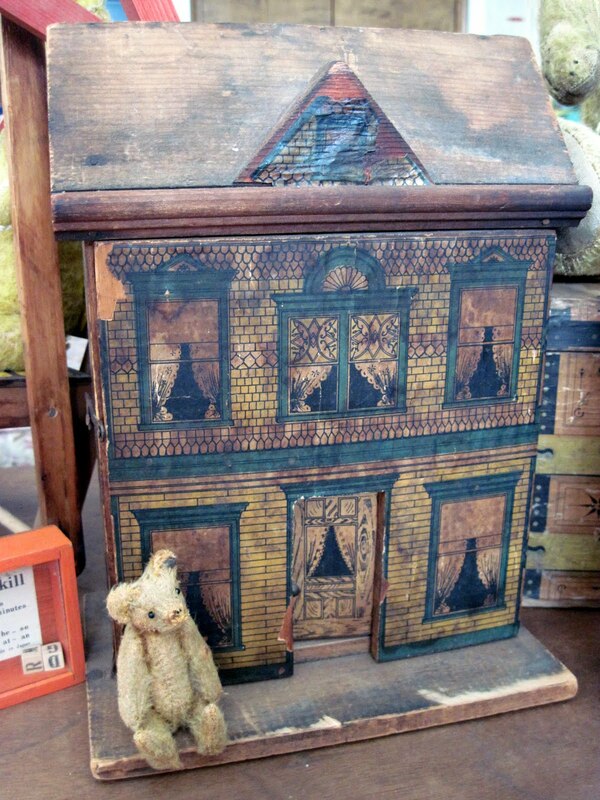 Last weekend, I was thrilled to acquire another one at an outdoor antique show, along with a miniature Steiff bear who is just the right size to live inside. 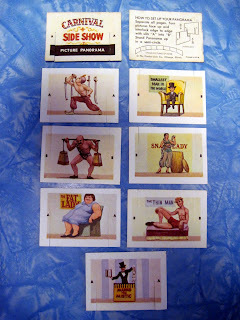 They were both made by the same unknown company in the very early 1900s, and feature fronts that swing open to reveal two simple rooms papered with their original oversized wall coverings. These houses are sometimes referred to as "Gutter Houses" by dollhouse collectors because of the prominent piece of molding that runs along their roofline, resembling a gutter. 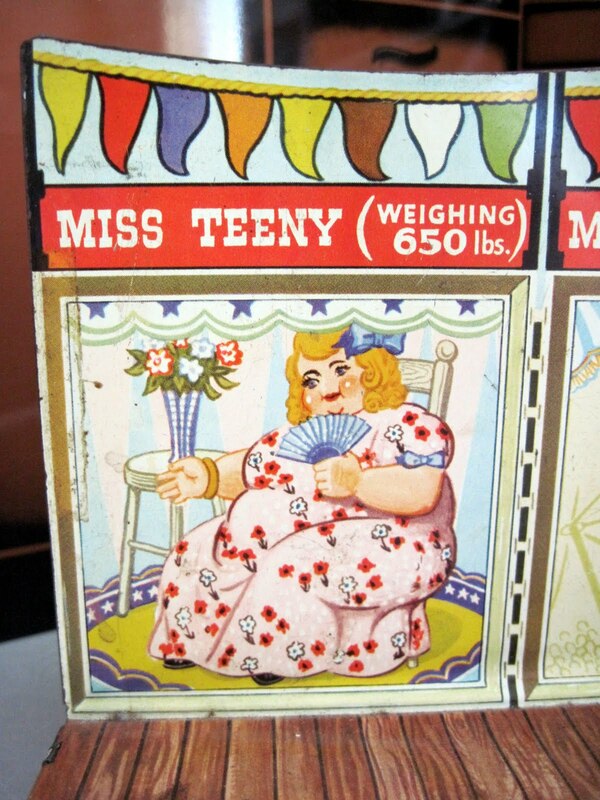 They were probably made in imitation of the more expensive Bliss houses available at the same time. 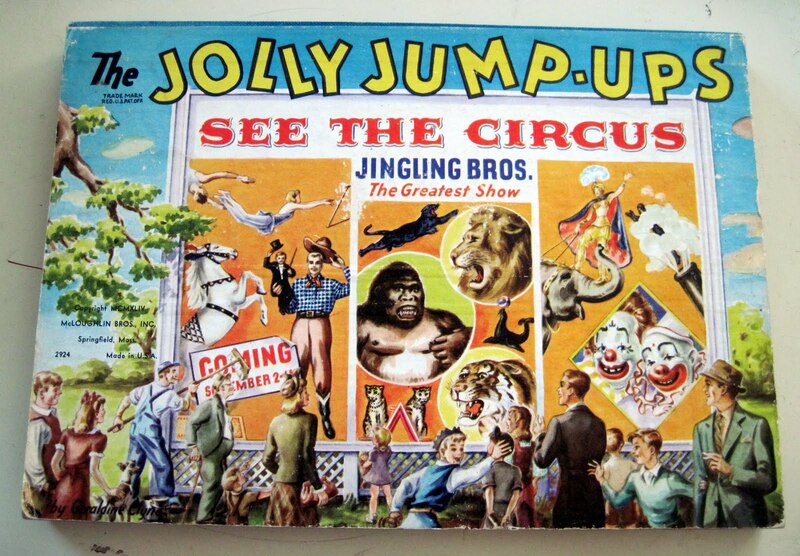 They originally had red-stained roofs that tend to fade badly with time; my first house has a roof that was repainted green, probably around the time of the Great Depression in the 1930s, when it may have been refurbished and gifted to a needy child. 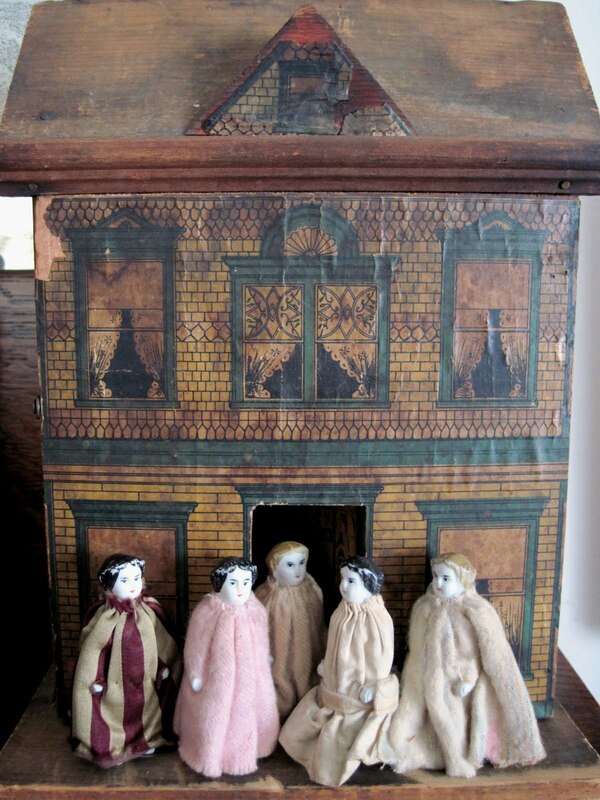 This new house is all original, and even smaller than the first, being only about 10 1/2 inches high. 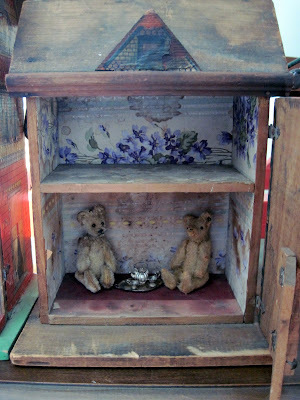 Two tiny antique Steiff bears have moved in to the first floor, where they are presently having tea. 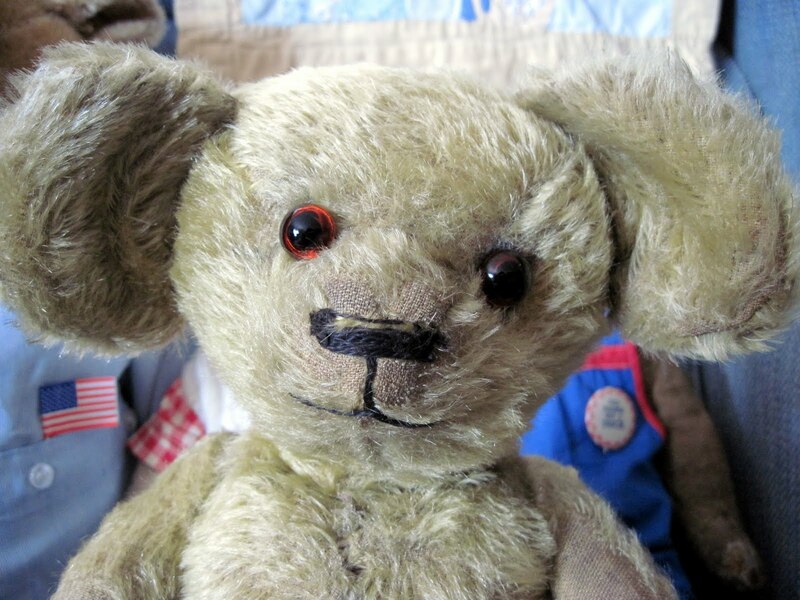 Purchased at an antique show this past weekend was one of the oddest teddy bears I've ever found, with definitely the biggest ears I've ever seen. 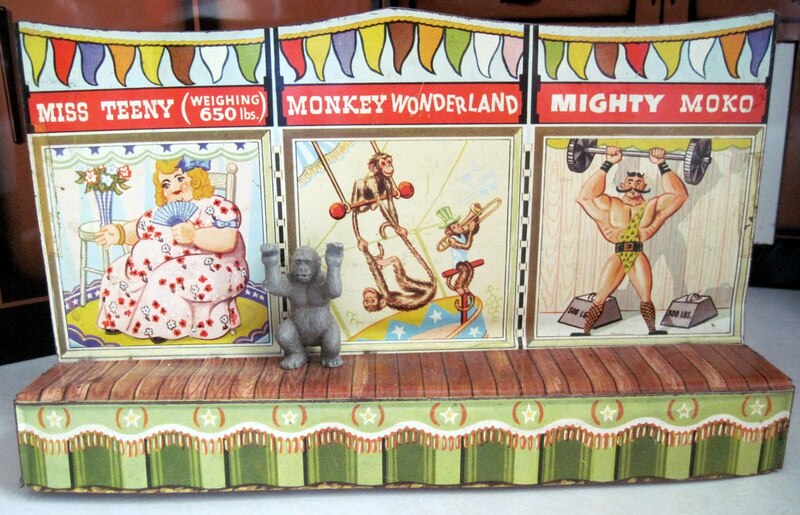 He measures about 16 inches tall, and I believe he is British, circa the 1930s. 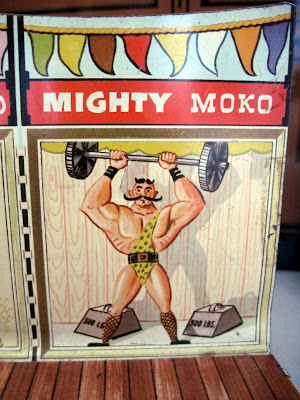 His face, body, and limbs are similar to bears made around that time by Peacock, but I've never seen any with ears quite like these. He almost looks like a cross between a teddy bear and an elephant! 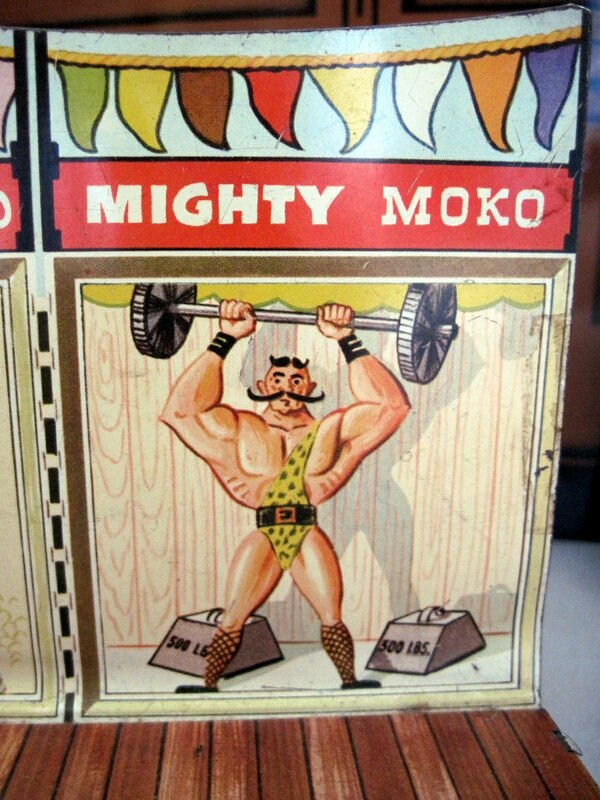 But he's cute and I love him. 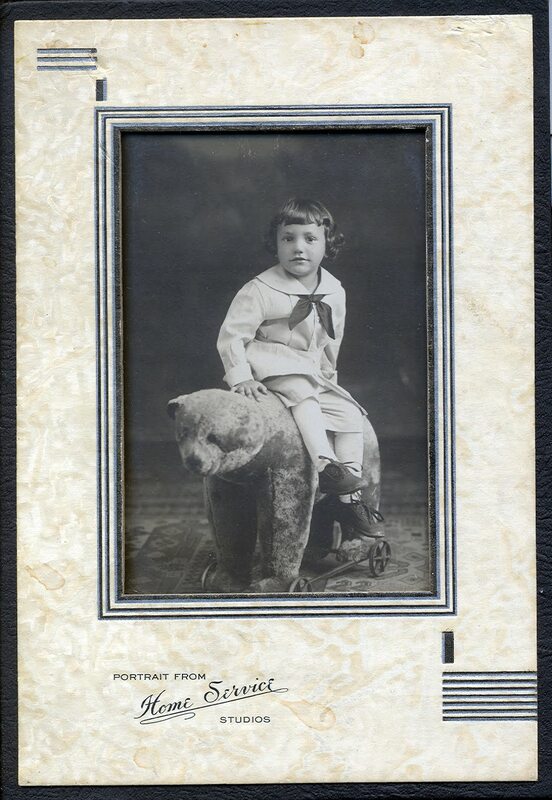 As an accessory to antique toy collecting, I'm always on the lookout for interesting old photos of children with toys. I found this fabulous real photo postcard at an antique show last weekend. Dating from the early 1900s, it features a little boy in a sailor suit on a Steiff riding bear. 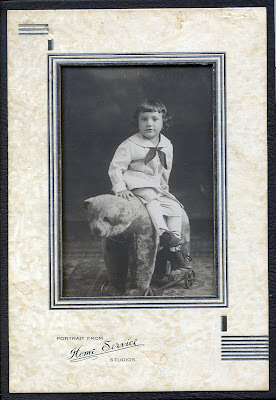 The back of the photo has a penned note with the child's name (Frank) and the comment, "Pretty curls". 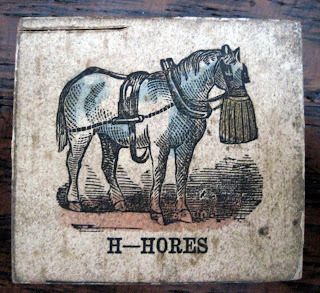 And indeed they are. 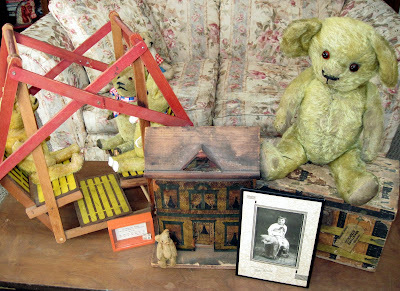 Found some great things at an outdoor antique show this past weekend: a miniature Steiff bear circa 1908; a very unusual British teddy from the 1930s with the biggest ears I've ever seen on a bear; an American lithographed wooden dollhouse from the early 1900s in a very petite size; a fantastic old photo of a child with a toy bear; a small doll trunk; and a doll sized glider swing. 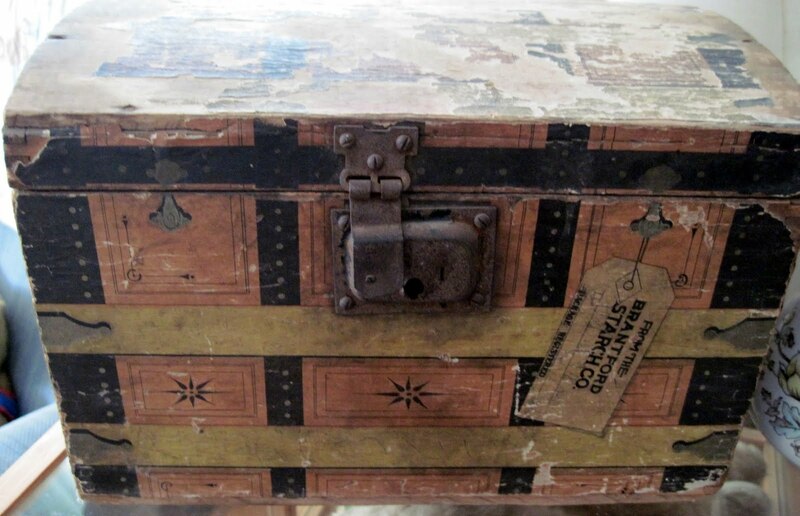 A sneak peek is shown below, with details to follow! 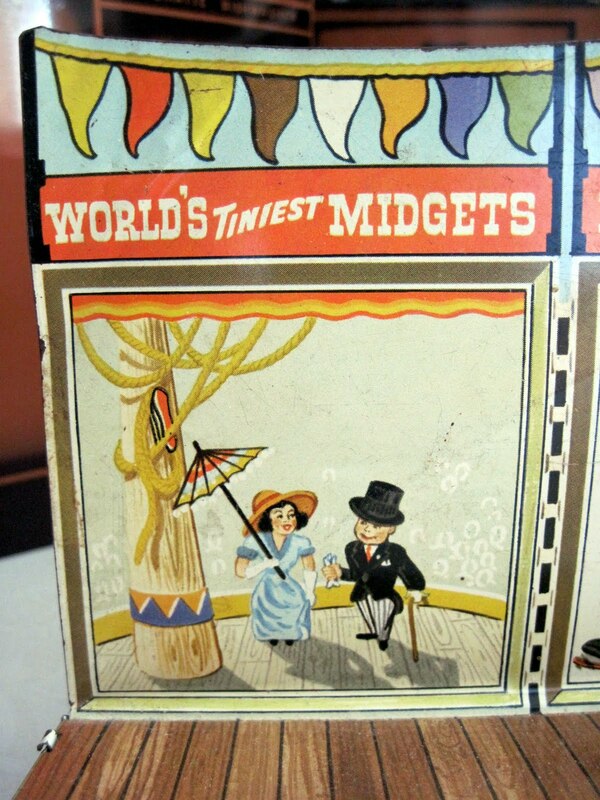 Here's another carnival-themed vintage toy that is, by today's standards, generally considered egregiously offensive. 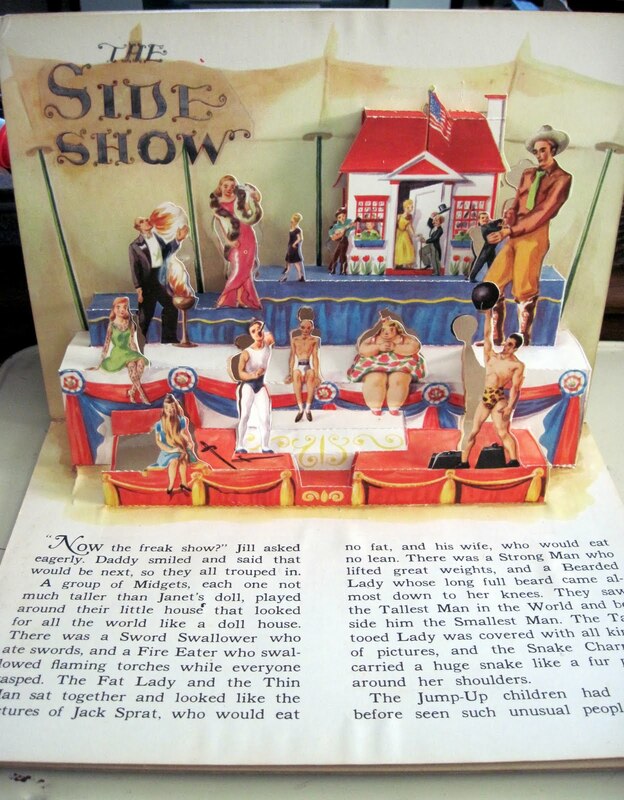 But it was phenomenally popular back in its day (the 1950s), when it allowed children the opportunity to run their own freak show! 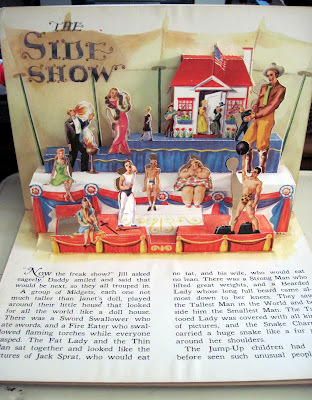 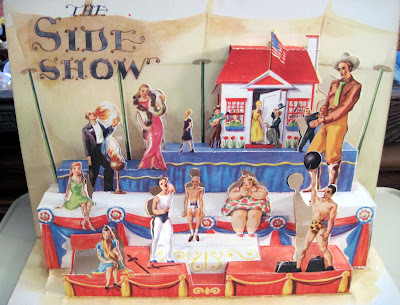 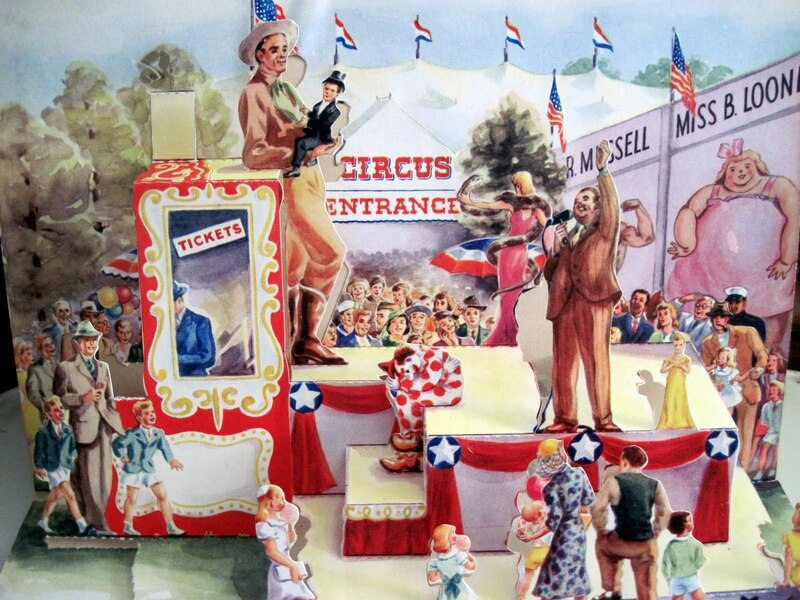 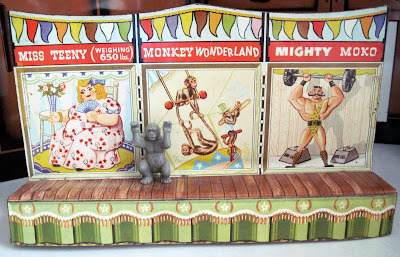 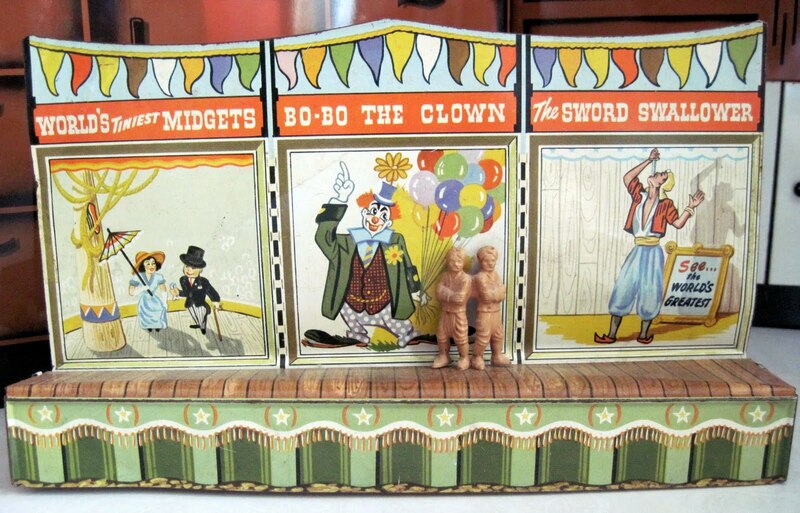 The Marx Super Circus was a huge playset of plastic figures and tin litho structures that included a big top, ticket booth, circus performers both human and animal, and visitors. It also came with a two piece sideshow, complete with lithographed banners and a variety of plastic freaks. 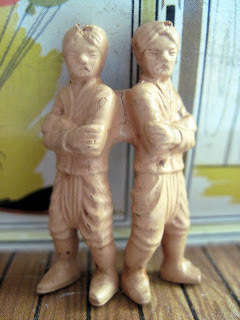 My sideshow has only one left: Chang and Eng, the famous real-life Siamese twins after whom all subsequent "siamese twins" have been named. 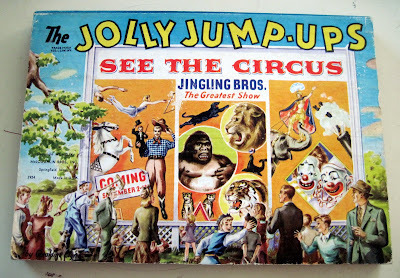 (There's a great article about Chang and Eng, with lots of historical photographs, here. I was fortunate to grow up in the 1970s, the last decade of really good Cracker Jack prizes, before those pesky "safety regulations" took effect. 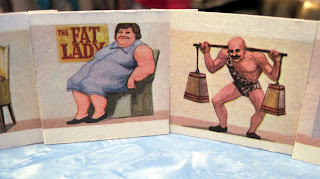 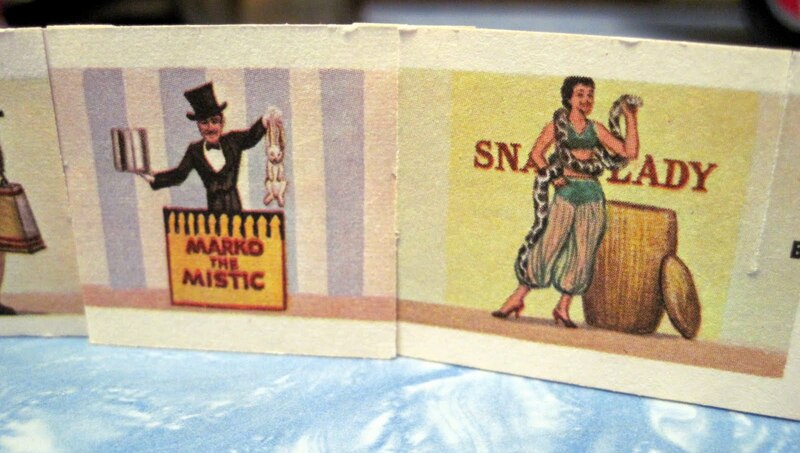 The best Cracker Jack prizes, though, are even older, like this one which dates from around the 1950s. 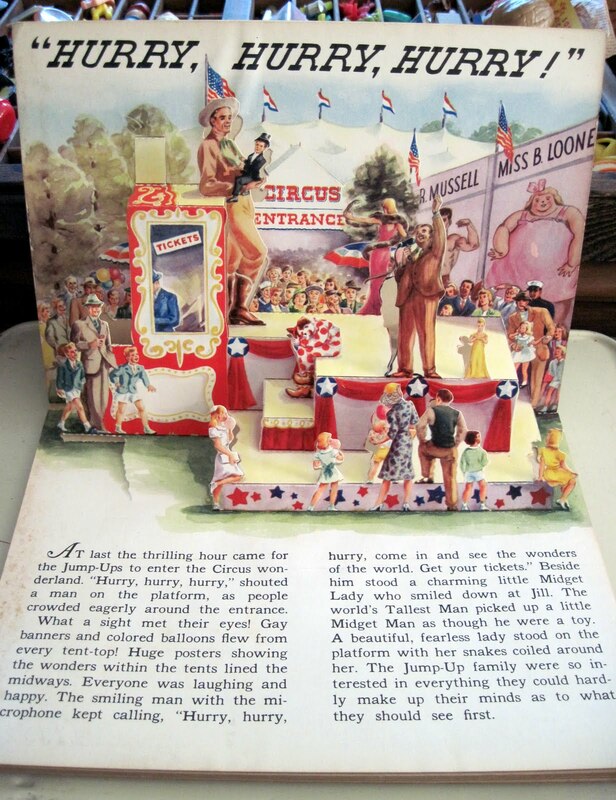 The tiny paper booklet, about the size of a matchbox, separates into individual pictures, which, when connected via tabs and slots, create an astounding carnival sideshow panorama. 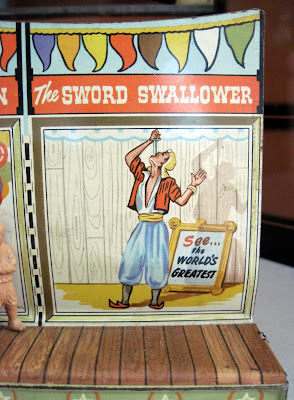 All in all, a pretty amazing "free" prize! 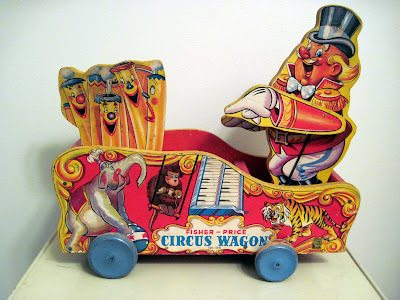 Here's another vintage Fisher Price circus piece: the musical Circus Wagon, made in the early 1940s. The wooden pull toy measures about 13 inches long. As it's pulled, the band leader's arms move up and down, as if he's playing the pipe organ, and a melodious song plinks and plonks. 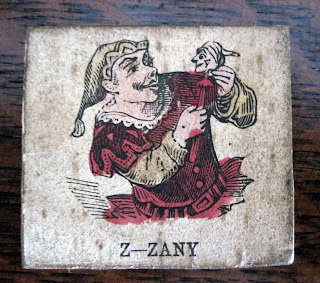 The lithographed paper features wonderful anthropomorphic pipes and an elephant who looks suspiciously like an unlicensed "Dumbo" film clone.